I can’t believe it’s been a full month since I quit my comfortable, 401K job, said goodbye to my friends in New York, packed my car with my life, and came to Philadelphia to pursue my dream. I guess it’s really hitting me because for the first time since I've started Circadium, things this week felt...normal. My first week was riddled with this mixture of excitement and soreness, followed by a week of complete exhaustion, and then a week of “new-program-bumpiness” syndrome. But this week has run like a truly established routine in which I finally feel strong enough to do more than just eat and sleep after a day of classes. I also began working part-time this week for a company that I had previously worked with in my old job. It’s not just the money flow that has me excited about that, but also the fact that I can keep myself in the Food Science world that I fell in love with years ago. But beyond that, this week I could see how our little troupe of Circadium Class 1.0 has taken on a whole new form. Our class is coming together and beginning to embody that cohesive, supportive unit I had hoped we would morph into. This is going to sound cheesy, but I feel like I could talk to any of my peers if I needed their help, and they wouldn’t hesitate to be there for me. That kind of support group was something I hadn't truly found before coming to Philly, and it was something I'd been craving for so long.. I felt like I was living half in the circus world and half in the corporate world, not truly belonging to either. So having this kind of community is more than just helpful - it’s something I am incredibly grateful for. Now that the excitement-high I was feeling towards this transition to circus school has officially begun wearing off, I want to start delving into the various disciplines we’re focusing on. Being that the goal for the first year at Circadium is to explore all the disciplines and become a generalist, we’ve been doing a little bit of everything. 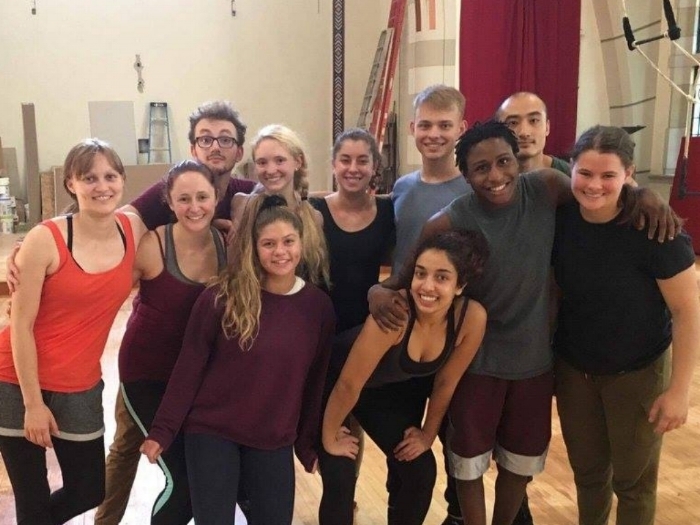 Next year we’ll pick a major and minor discipline to focus on, but for now, being exposed to all aspects of circus and gaining the basic skills for each is something that will make us all well-rounded, multifaceted artists. As I mentioned in my Training Tip Tuesday post, so many aspects of circus are transferable between disciplines, so training all the disciplines is something I’m really valuing. Currently, the apparatus we’re working on that is most foreign to me is tightwire, which before Circadium I had never done. So this week, I’m going to tell you about wire! Though I’ve been slacklining a handful of times over the years, tightwire is a whole new kind of balance. When I heard we had to do wire I didn’t think I was going to like it. To be honest, I thought I was going to hate it. I enjoy the ease and flow that slackline provides, and didn’t see that transfer to the rigidity that I perceived was wire. I also prefer artistic acts to danger acts, and most of the tightwire acts I’ve seen are focused on the danger of the height as opposed to the beauty of the wire. So to my complete surprise, I really started to enjoy wire. I’ve begun to appreciate the simplicity of a beautiful walk. It’s not that challenging to just walk across the wire. But to do so beautifully? That’s what takes years of practice. Wire is one of those disciplines where you don’t start learning tricks or new moves until you’ve walked for hours and hours. So though I’ve learned a few very simple tricks and walks, for most of the class we just walk, working on making something that takes so much core and arm strength look elegant and simple. It’s fairly similar to ballet in that regard - the strength a dancer needs to hold their arms so elegantly and in place is taken for granted, but is actually quite incredible. This week, a woman by the name of Ronja Breuk from Rotterdam, Netherlands was visiting the US. She majored in wire in a circus school in the Netherlands, and was passing through Philly on her way to a gig she had in California. She was able to give us a demonstration and mini lesson during class. Her visit opened my eyes to the wire walking world, and her love of it. When doing a little digging on the internet to learn more about her, I found this really interesting video on the science of balance, using wire for demonstration purposes. Interestingly, there is a large community of wire walkers in Philadelphia, somewhat due to the presence of a gentleman by the name of Dave Gillies. Dave is a Philadelphia native who got his bachelor degree in English from West Chester State college and began working as a 5th grade teacher after graduation. His juggling career started when a juggling troupe performed during a PTA assembly at his middle school. Dave noticed how focused his students were on the performance, and was inspired to learn to juggle. He bought a book, taught himself, and soon after began teaching his students. As they progressed, he and his students were invited to perform at local events. Then in 1975, Dave turned his juggling hobby into a small business when he founded The Give & Take Jugglers, a small circus troupe that is still around today. Meet Dave Gillies, founder of the Give & Take Jugglers and Funicular Circus. Dave is also the co-director of Funicular Circus, a wire-walking performance troupe here in Philadelphia founded in 2010. Funicular Circus came into the headlines earlier this month on September 2nd, when two of the members, Alice Herrick and Rylee Gallagher, broke the Guinness World Record for the longest distance walked across a tight wire in high heeled shoes. It was previously set at 50 feet, and they walked in heels just over 68 feet - in the rain! You can check out her world record walk below. Learning about this community of wire walkers sparked my interest, and I did some more digging into some of the most famous wire walkers that my teacher Richard had spoken to us about. The Wallendas are a 7 generation family of wire walkers, starting with Karl Wallenda. Karl was born in Germany in 1905 to a traveling circus family dating back to the 1780s. By age 6, Karly was performing with his family, and was a skilled acrobat and tavern entertainer before he was a teenager. After learning to walk wire in his teenage years, Karl put together an act with his brother and two other aerialists (one who would later become his wife), and they began touring Europe. The act was then hired by the Ringling Brothers, and for their debut as “The Great Wallendas,” they performed without a net as it had been lost in transit. That solidified a name for the Wallendas, and since then, the Wallenda family has been known for performing without a net. Over the years, the Wallenda family has developed many precision wire tricks, one of the most famous being the 7-person chair pyramid (pictured above). Their success has made them a household name. But the Wallenda family has also a large share of tragedy in their career due to this perilous career. A recent fall in February during an 8 person pyramid caused 5 members to fall over 28 feet, one of whom broke every bone in her face. Besides a number of injuries caused by falls, death has taken its toll as well. In 1962, a misstep at the State Fair Coliseum in Detroit during the chair pyramid caused the death of two performers and the paralysis of a third. Rietta Wallenda, Karl’s sister-in-law, fell to her death in Omaha. And Karl, the Patriarch himself, walked tightwire until his death at age 73, when he was blown off the wire while attempting to cross between two hotel towers 100 feet high. But through all the death and tragedy, Karl’s family continues his legacy of precision wire walking, topping themselves in each performance. I don’t expect to be doing wire at any death-defying heights anytime soon, and even if I do pursue it further, I would do so with the safety of a net below or harness. However, the more I learn about different circus apparatuses and circus history, the more it fascinates me. Circus has such a rich, longstanding history, and I feel so fortunate to get to dive into this world now. In a few more weeks, we’ll be moving from tightwire to other equilibristic apparati, including the unicycle (another discipline I have extremely limited experience in). So stay tuned for other adventures. Now, I’m off to walk the wire!